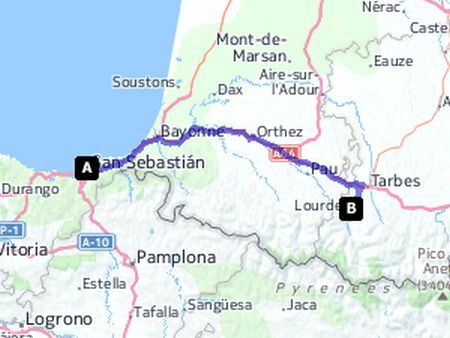 The driving distance from San Sebastian to Lourdes in about 130 miles and takes about 2 hours to get there. 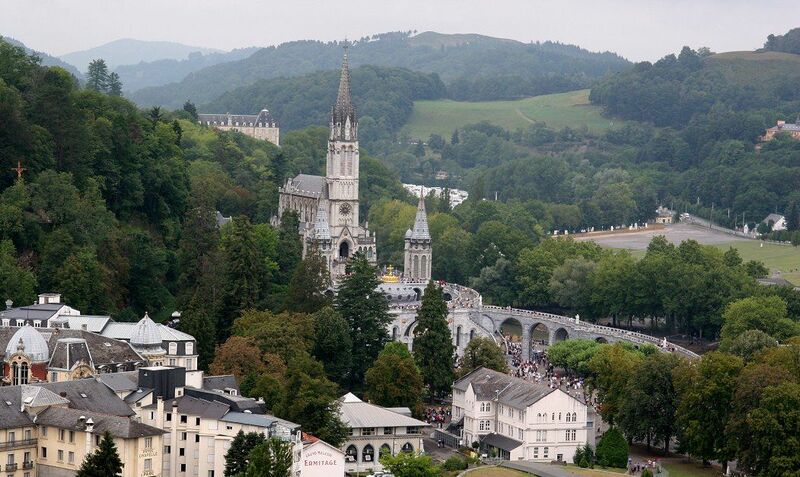 Lourdes is a small town in the Hautes-Pyrenees department in the southwest of France. 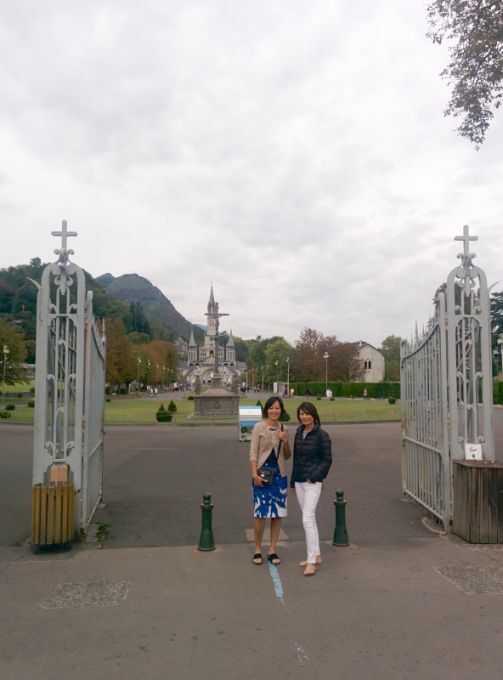 Lourdes is the largest Catholic pilgrimage destination in France, and one of the most popular Catholic shrines in the world. 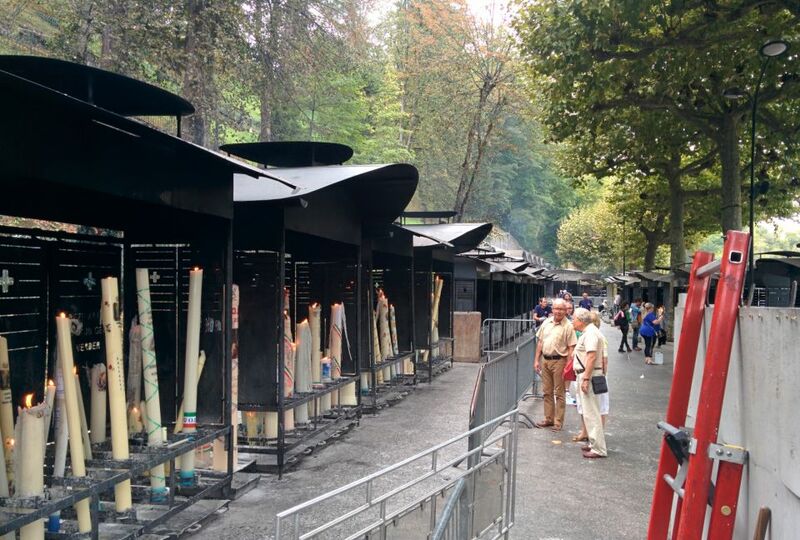 Lourdes has about 17,000 inhabitants but receives more than 5 million pilgrims and tourists each year because of visions & apparitions of the Virgin Mary reported by a young girl named Bernadette in 1858. 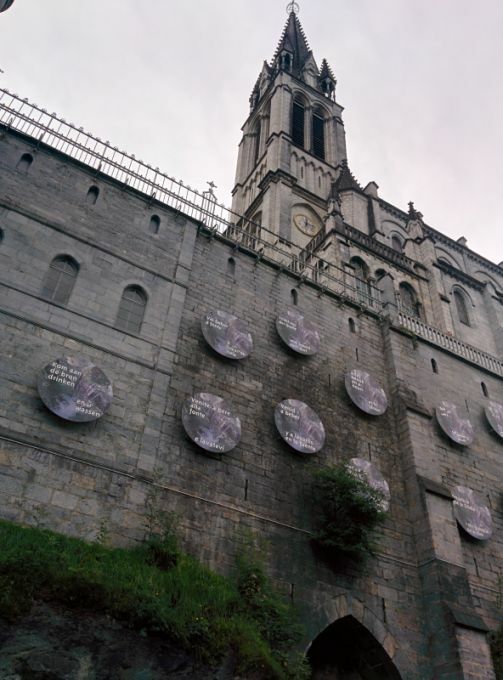 We arrived at Lourdes but parking nearby was impossible to find so we had drive around and we found ourselves up a hill looking down at Lourdes. 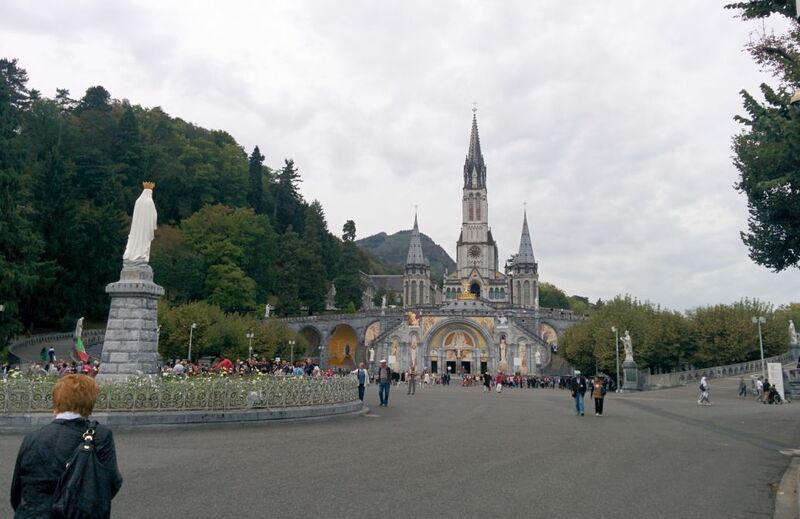 The Sanctuary of Our Lady of Lourdes incorporates 52 hectares of property and 22 places of worship, including the sacred grotto, two basilicas, and a variety of buildings for pilgrims and the sick. 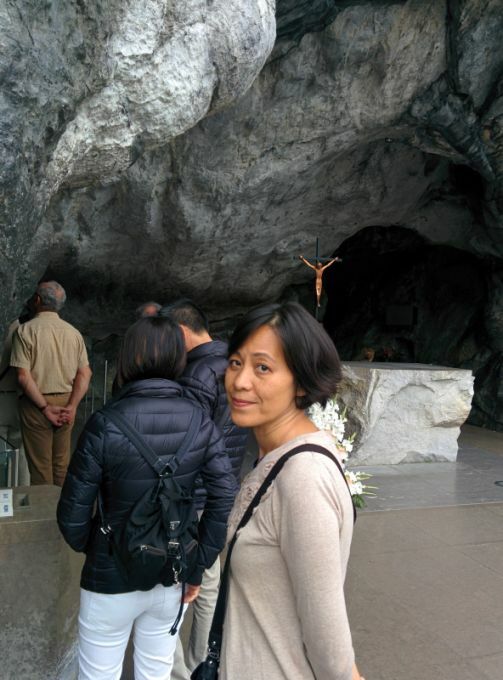 Outside the sanctuary, many pilgrims also visit the Lourdes home of the young visionary Bernadette. As you can see the property is huge...we are getting closer. 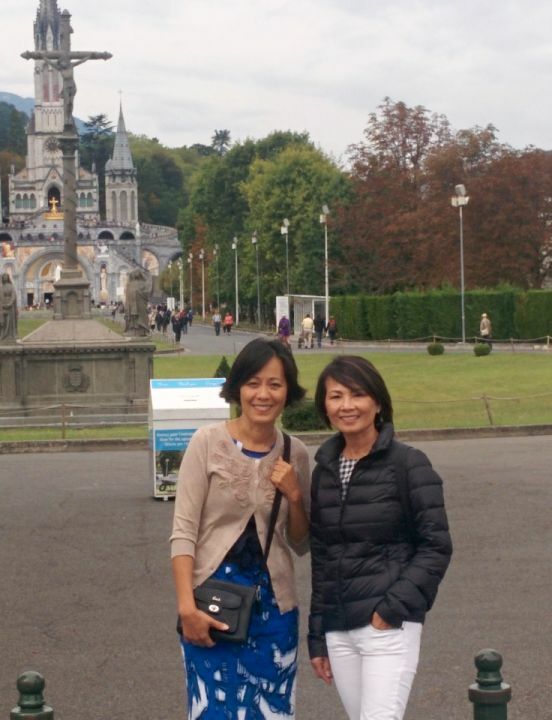 In the background is the Basilica of our Lady of the Rosary. 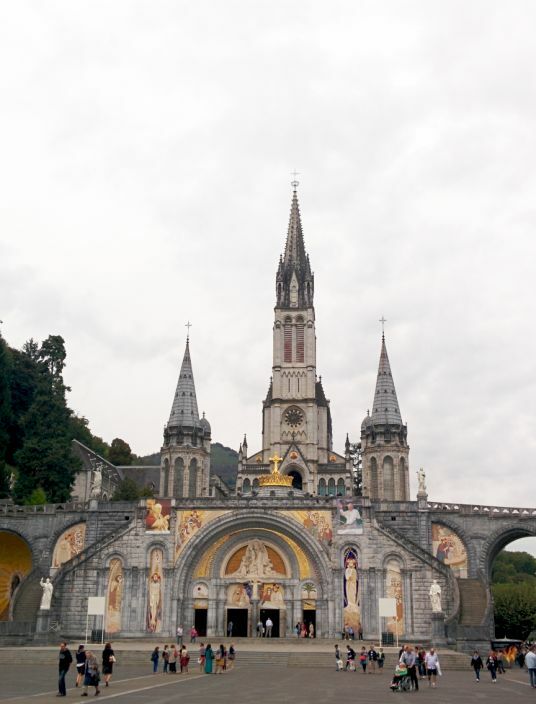 The Basilica of our Lady of the Rosary (Notre Dame du Rosaire de Lourdes in French) is a Roman Catholic church and minor basilica within the Sanctuary of Our Lady of Lourdes. 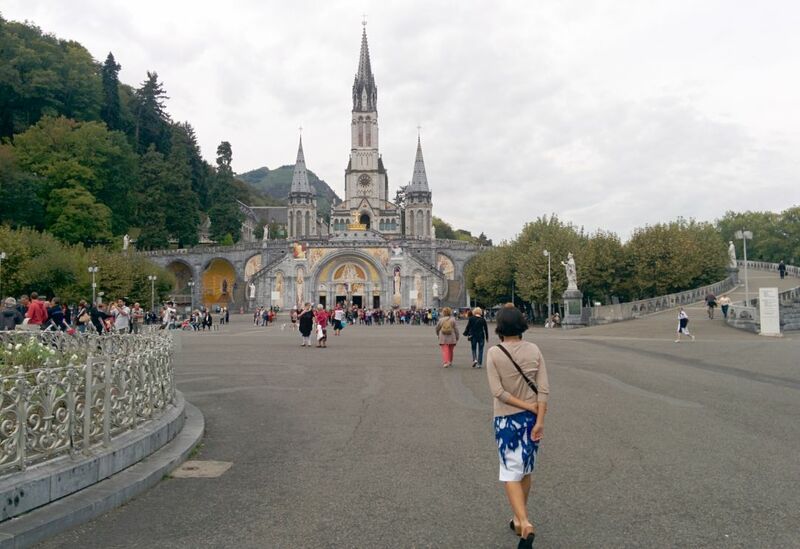 When she appeared at Lourdes, the Virgin Mary was described by Bernadette as holding a rosary in her hand and so the Basilica of the Rosary is dedicated to this theme. 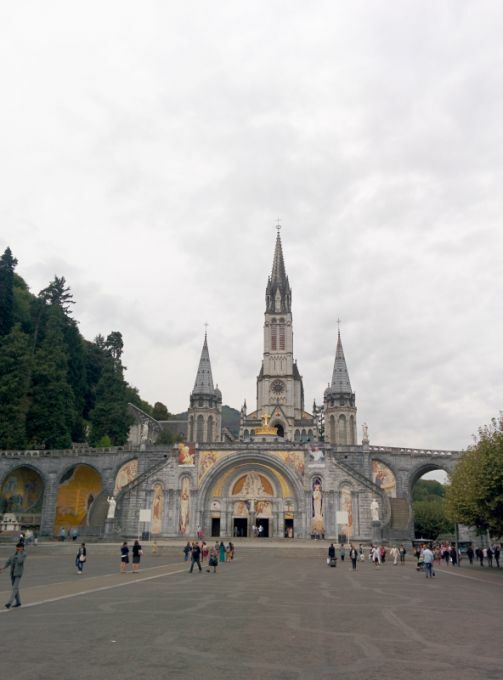 Designed in a Byzantine-influenced Romanesque style, the Rosary Basilica has a square that can hold almost 80,000 people. 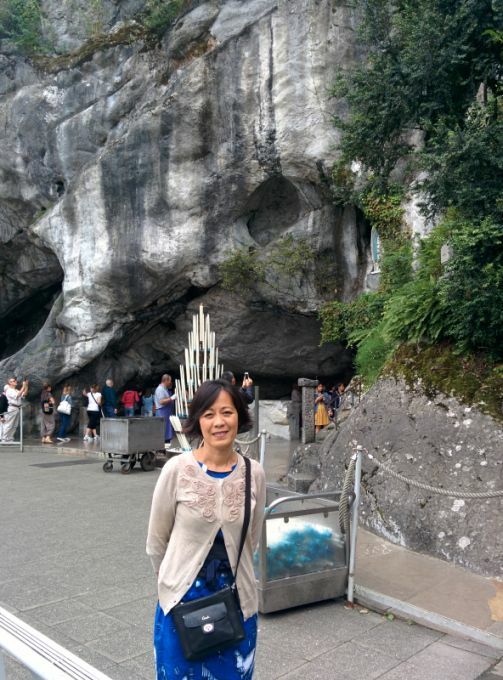 The last time I went to Lourdes was over 30 years ago. 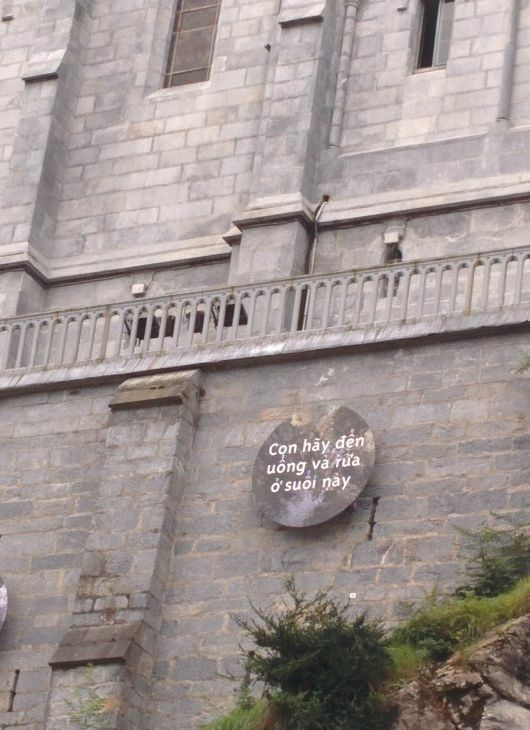 It was in the summer and at the height of the tourists season and I remember this place was filled with people. 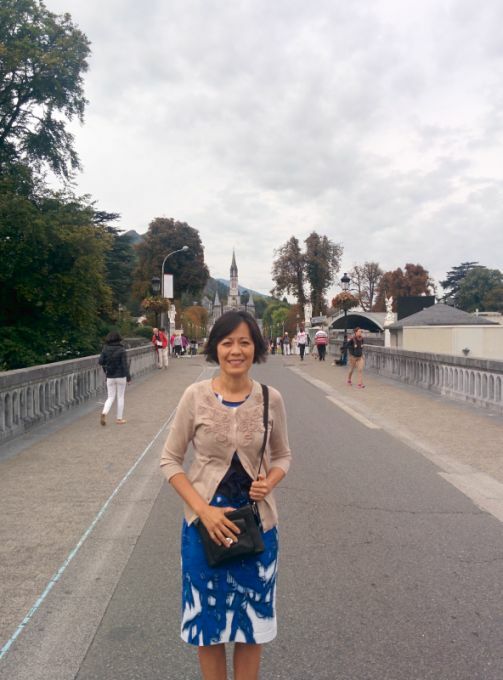 We are in September now and the tourists season is over but there are still quite a lot of people. 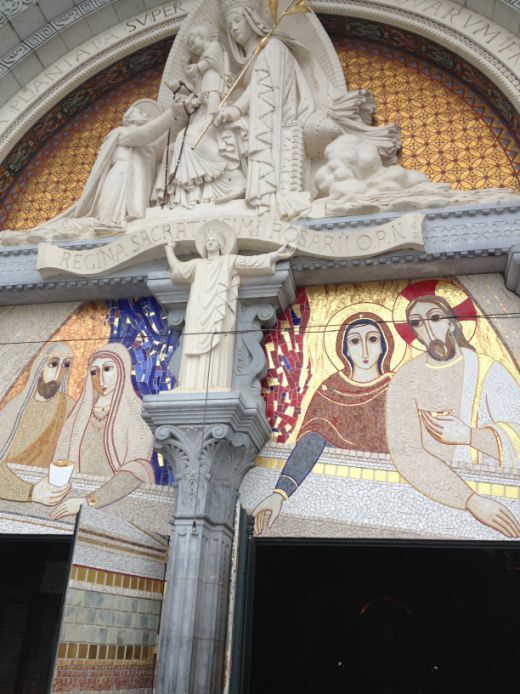 Basilica of our Lady of the Rosary is the third of the churches to be completed on the site after the Crypt and the Upper Basilica which you will to see a bit later. It was designed by architect Leopold Hardy and completed in 1899, consecrated in 1901 and has a capacity of 1,500 worshippers. 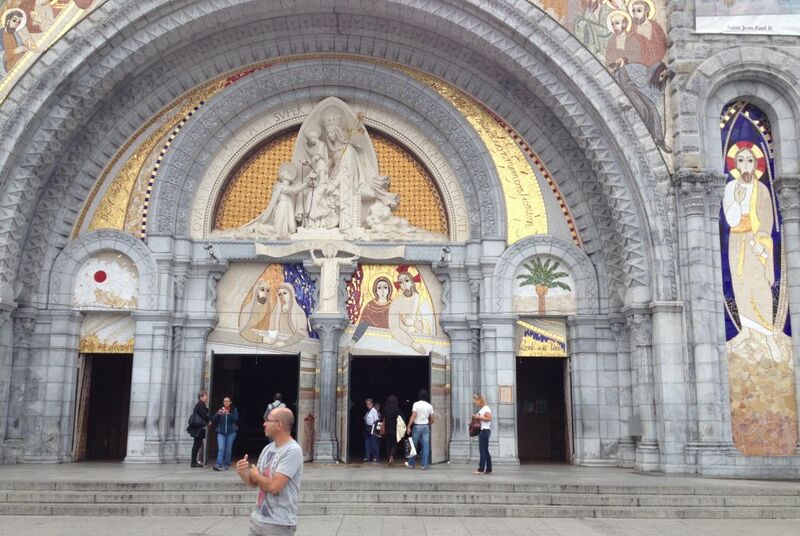 Its three arches depict the joyful, sorrowful and glorious mysteries. Catholics meditate on these mysteries (events in the lives of Jesus and Mary) while saying the rosary. 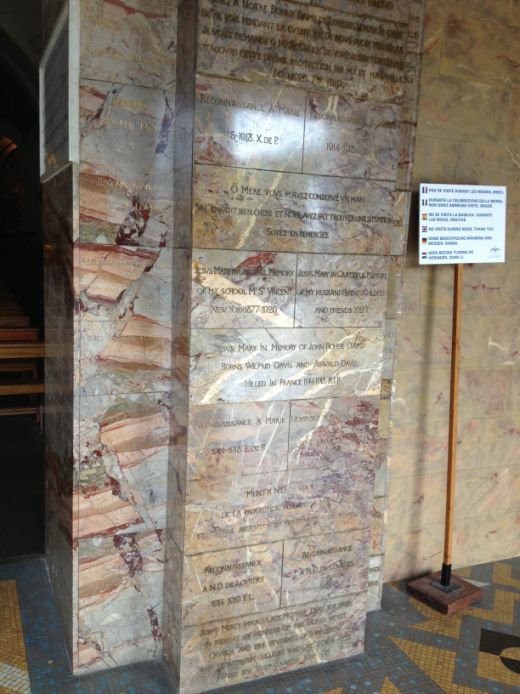 At the entrance on the right is a marble plaque containing the complete text of the judgment made by Mgr Laurence, recognizing the Apparitions as authentic. Close look at the Marble plaque. 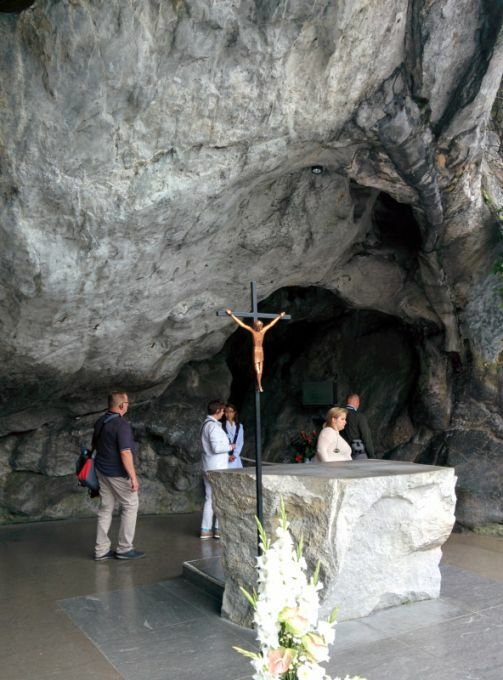 The Grotto of Massabielle is the site of St. Bernadette’s visions of the Virgin Mary in 1858. 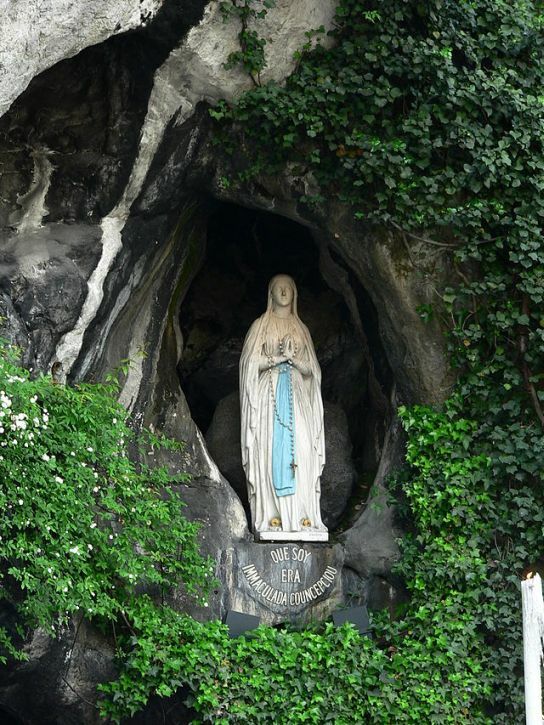 The Blessed Virgin is said to have pointed out a previously undiscovered spring in the grotto and instructed Bernadette to drink from it. 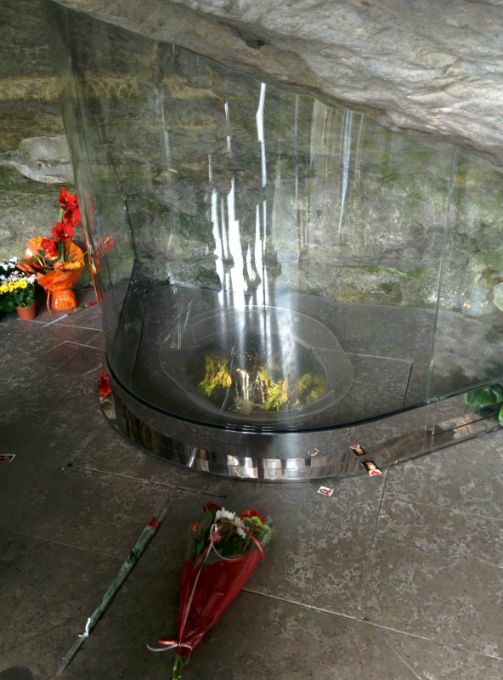 The spring water from the grotto is believed to possess healing properties, and the Roman Catholic Church occasionally officially recognizes miraculous healings. 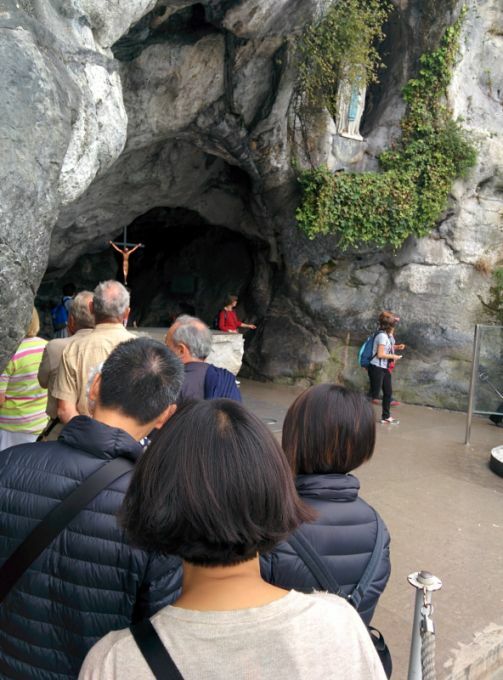 Faithful pilgrims, especially those in need of healing, flock to the Grotto of Massabielle to immerse themselves in the grotto’s 17 pools. Welcome sign in different language they even have on in Vietnamese. 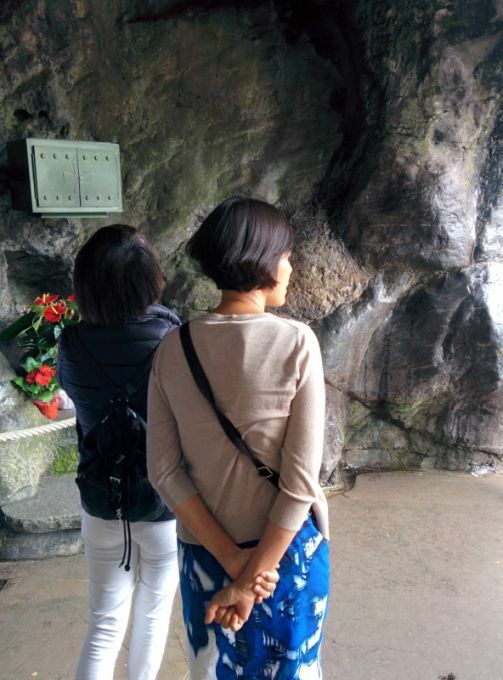 We are staying in line to see the grotto. 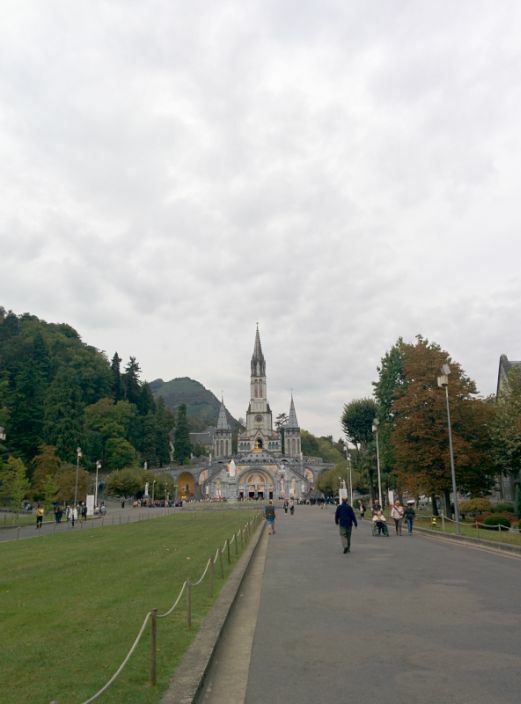 The apparitions at Lourdes were reported in 1858 by Bernadette Soubirous, a 14-year-old miller's daughter. From February 11 to July 16, 1858, she reported 18 apparitions of "a Lady". Bernadette described the lady as wearing a white veil and a blue girdle; she had a golden rose on each foot and held a rosary of pearls. 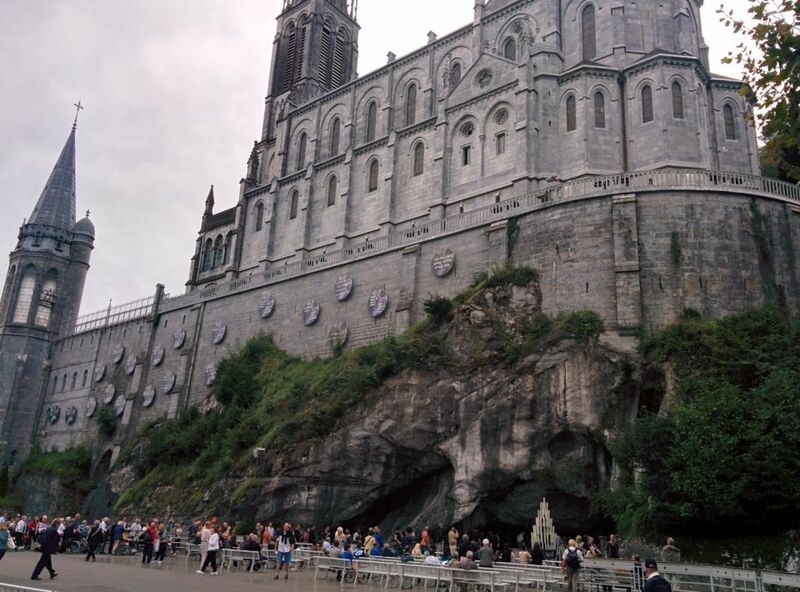 Despite initial skepticism from the Roman Catholic Church, these claims were eventually declared to be worthy of belief after a church investigation, and the apparition is known as "Our Lady of Lourdes". 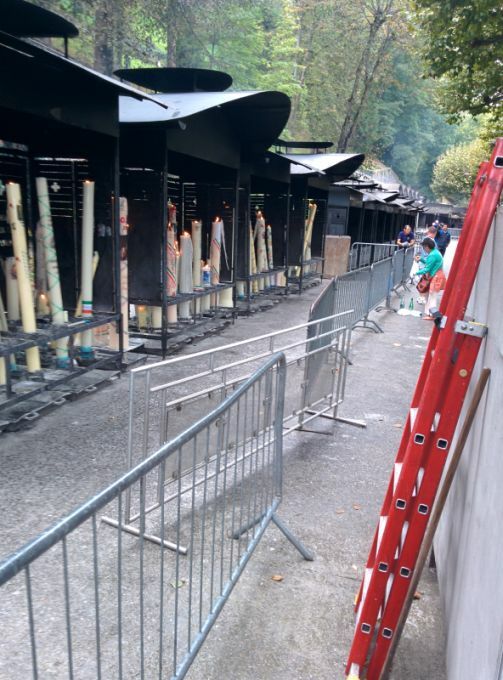 Apparently you can go online, buy a candle (they have a variety of sizes) and they will lit and pray per your request. 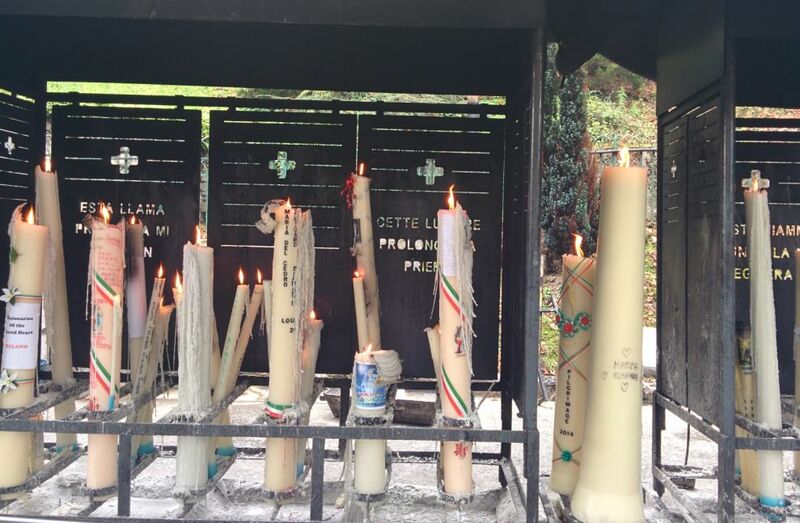 Request for burning a candle came from all over the world.